Today was one of the liveliest and most fun Saturdays at The Tobacco Hut in a long time! In attendance were Joe K, Vic, Tom L, Lou, and me. And, winning the Traveled-The-Furthest-To-Attend Award was Mike G, all the way from Tennessee. And he brought his son-in-law Bob with him. It was a wild affair from the start when Vic brought in a large cooler filled with, of all things, deli meats. As many of you know, Vic "knows a guy" in New York who makes homemade various kinds of sausages, deli meats, and liverwurst. We've had recent tastings of liverwurst and apparently Joe placed a monster order, which Vic delivered today. Tom and I sat in amazement while they actually weighed out various amounts of meat on Lou's tobacco scale. Don't know if Vic kept the proverbial thumb on the scale or not. Joe amassed a fairly large quantity of various and sundry meats, money was exchanged, and it was all wrapped up and put back in the cooler for safe keeping. At one point, Tom made a grab for the cooler, but Joe gave him the "Look of Death", and Tom slowly eased back into his chair. I don't think I've seen Joe as protective of something since he leaped out of his chair and chased some kids with a shopping cart away from his car ten years ago. Vic also brought in copious amounts of cheese, including a delicious Welsh cheddar cheese from Sam's Club. Actually, all the cheeses he brought in were from Sam's Club and, although I'm reluctant to admit it since I hate all things associated with Wal-Mart, it was all very good. Tom had never tried liverwurst before, so one of the frozen chubs was put outside to thaw. Crackers were opened and Tom was soon no longer a liverwurst virgin. I won't describe what Tom did with the 18" long chub of liverwurst before it was sliced open. Suffice to say that the woman across the parking lot at the Windmill water station was more than a bit surprised. Before I forget, I have to point something out - something that everyone said wouldn't make it onto the blog. Vic brought his iPad in and was trying to find his bookmarks. He brought up the bookmark menu, but the actual links weren't there. He asked if I would take a look at it, so I did, being the "Apple Guy". Well, I couldn't find them either and suggested that somehow they had been deleted. At that point, Joe (I think it was Joe, may have been Mike's son-in-law Bob) clicked the "Bookmarks" button and all the bookmarks magically appeared. So yes, I didn't know something. However, Vic later asked if I could expand a chess game on the iPad to fill the screen and I successfully did that, so I believe I am vindicated. Vic announced a new business venture - selling his prized nuts. It's not as bizarre as it sounds. He's actually licensed a cart from The Nutty Bavarian. 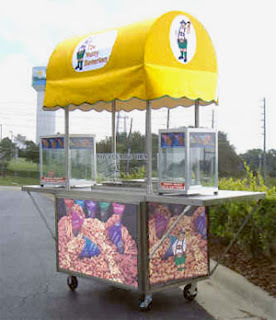 He'll be setting up shop soon in the Red Barn flea market in Bradenton, selling cinnamon-glazed roasted peanuts, cashews, pecans, and almonds. Vic has a friend who's been doing it up north and has been quite successful with it, so he's taken the plunge and very shortly Vito Paul's Nutty Bavarian cart will be open for business. Congratulations, Vic, and good luck to you! Vic has traded in his prison guard uniform for that of the Nutty Bavarian - glazed roasted nut extraordinaire! Of course, being typical, immature guys we couldn't let the opportunity pass without making numerous references to Vic's nuts. Most were too vulgar to repeat in a family-friendly forum. Too bad Scott wasn't here today; Vic showed off an awesome knife. Scott, you would have been drooling, my friend. Mike: Yeah, a snicker-doodle cupcake. And it was out of this world. Tom: Did you bring one back for Lou? Mike: Yeah (reaching into his pocket), I got your snicker-doodle cupcake right here. I've been walking around for two weeks with this thing in my pocket to give to Lou. Just disregard all the lint and it might be a little stale, but enjoy! Now if you know Mike, imagine him saying those last lines absolutely dripping with his one-of-a-kind sarcasm, and the rest of us absolutely busting a gut laughing. Tom and I were practically in tears. Throughout the day, Joe and Tom were involved in high-level negotiations regarding some sort of probably illegal boat transfer to James in Atlanta. Today had it all - a little earlier Tom and I witnessed Joe passing Bob some kind of substance marked "Dramamine". Not sure what that was all about, and probably don't want to know. Deli meats from a questionable source, boat transports, Dramamine transfers, Vic's nuts...the mind reels. At another point in the day an African-American father of three came into the store with his three young boys selling M&M's as a fundraiser. The boys were a little shy, but explained that it was for their school and it was for a "Night of Stars". Tom asked them who some of the stars would be in attendance and one of them replied with the name of some black artist that none of us had ever heard of. After a moment of silence, the father said, as explanation, "It's a black thing!" and we all burst out laughing. The wallets opened up and M&M's were purchased. After they left, Mike brought out his trusty pair of dice and said, "Bring those kids back here and let's play with these. It's a white thing!" We were hoping that Darryl would show up. He had e-mailed Lou and me earlier in the week saying that he had been under the weather but was hoping to make it today. Hope you're still on the mend, Darryl, and can make it in soon. Peter was in Ft. Myers, but he said hello to everyone via phone when I called him. No sign of Paul O, who's been stopping in regularly for the past several weeks. Adrian apparently came in yesterday, but was afraid to show up today for fear of losing his second game in a row of chess. I'm sure I've forgotten numerous things that occurred today, but what a fun day at the Hut! By the way, today saw me smoking a Crown Viking freehand I bought from Lou several years ago. I had it filled with a new tobacco for me, Wilderness. It's created by blender Fred Hanna and put out by McClelland. I got it from a guy on Smokers Forums and today was the first day I tried it. What a wonderful tobacco! It has Virginias, Orientals, and both Cyprian and Syrian Latakias. The layers of flavor were readily apparent and it was a smooth, but rich tobacco. Lou filled up a bowl as well and enjoyed it with me. A shout out to Lou for cleaning, sanitizing, and polishing up a pipe of mine I'm sending off to the guy on the same forum. It was an H. Jones Easy Loader originally owned by my stepfather. I got it when he passed away several years ago and I don't smoke it too often anymore, so I thought why not pass it along to someone who will enjoy it. I completely agree with Bob...Saturday was one of the best afternoons at the Hut in quite a while. Having Mike back for an afternoon was great, he looked good and we definately miss his quick wit and sense of humor on a regular basis. We had a great group of individuals enjoying fine tobacco and questionable conversations. Can't wait to do it again soon. Great job Bob..again...by the way I went to pick that meat up with Vic and we got it at a Chinese Rest...located in a neighborhood that was missing MANY dogs and cats, oh well you know Vic???? P.S. By the way He used my car when he was here, and in just 2 wks, he put 1,396 miles on it????? I thought he drove back there to the last smoker? ?